Full quote - tell us what you want and we will provide a fully packaged no obligation quote with no hidden costs - includes all meals, accommodation, transfers, on-island transport and choice of any daily activity we offer plus NZ airfares if required. 3 Night Stay Discount: Receive a 5% discount for a minimum 3 night stay and minimum of 4 guests in the group. Ideal for small groups. Group bookings: Receive a 10% discount on groups of 10. Free accommodation and activities for one person when you book a group of 10 for 2 nights or more. Note: Accommodation rates include all meals. Choose from our range of personalised walking, boat and luxury 4x4 Tours. Standard daily rates start at $100 per person, price will vary depending on size of group and type of activity. All activities include transport and guide. Lunch is provided as part of the accommodation package. The "Original" Pitt Island Day Tour has been operating for over 20 years with hundreds of happy customers. If you are on a tight schedule and cannot stay with us (we’re gutted) then our fully escorted 4x4 Day Tour of Pitt Island takes in some of the island's most scenic vantage points. Most day guests wish they were staying. The full day tour includes scenic flights to and from Pitt Is, full day tour and lunch at the Lodge. On our Tour you will get a full appreciation of the Islands flora, fauna, history and island life. Price is $380 per person, minimum of 4 required. Our fully air-conditioned vehicles are warranted and registered for your safety and comfort. Download Day Tour flyer below. For those that have a few days, here is a selection of activities that may interest you. We can tailor make any combination or package to suit. Pitt Island is home to at least 21 endemic bird species and no less than 52 endemic plant species. During the course of your stay, your guide will endeavour to acquaint you with all our special treasures. Please advise if you have a special interest in birding or botany, we can show you things you have not seen before. As with all our tours and travels, your guide will provide an amazing insight to the lives and habitat of the original Pitt Island inhabitants. The Moriori of Rangiauria (Pitt Is) have left many traces of their dominance on the Island for over 700 years. So too have the early English settlers and their descendent's who now make Pitt Is home. 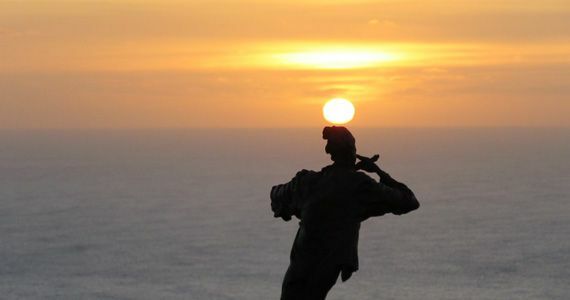 An absolute must, sunrise walk, be the first in the World to see sunrise, amazing 360o views of Pitt & surrounding Islands plus a chance to see an Albatross close up. If early mornings don't suit, we can do this walk any time of day. If boat fishing is not your thing and you want to catch a fish the way one could in the mainland many years ago, we will happily provide all fishing gear and take you to one of our favourite fishing spots. We almost guarantee a feed and will willingly cook it for your dinner. Utilising the services of our charter vessel, A-Lure, take a half or full day tour of Pitt Island and the outer islands. The amazing views from the water provide a totally different perspective on the island's volcanic origins. Caves, archways and secluded bays abound. An absolute must-do if sea conditions permit! You'll be blown away by the scenery. Enquire for rates. Half & Full day boat fishing trips from the Lodge doorstep, minutes to excellent fishing grounds. While Blue Cod and Hapuka are plentiful at most times of the year, other species can include Terakihi, Blue Moki and Shark. All fishing gear provided. Please note that Flowerpot Bay Lodge strictly adhere to the local recreational catch limits. Enquire for rates. 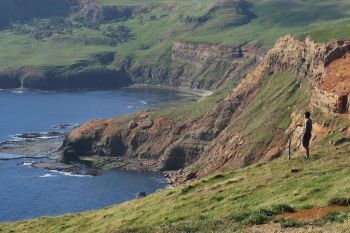 The famous Saxon Merino Pitt Island wild sheep have roamed free on Pitt Island for over 150 years. 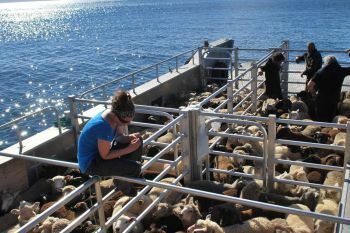 While now constrained to the isolated rocky cliffs - their preferred habitat - these wild sheep are not farmed in any way. Treasured as a source of food and recreation, islanders strive to preserve this now rare breed by promoting sustainable and managed hunting which not only helps to preserve the breed but brings vital income to the island. Flowerpot Lodge has exclusive access to this resource and works closely with land owners to provide a safe and enjoyable hunt. Download Hunting & Fishing packaged holiday information sheet below. Enjoy the crystal clear unspoilt waters around Pitt Island. 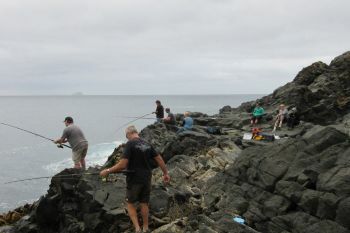 Reefs, coves, drop-offs, crayfish and spear fishing. Weight belts and wet suits provided. Snorkelling can be easily incorporated into the daily activity. For Scuba divers, boat charter and air fills will be available soon, please enquire. Travel Pitt Island how the Islanders do, the fun and relaxing way to explore the Island. Fully guided UTV adventures for the less physically inclined. 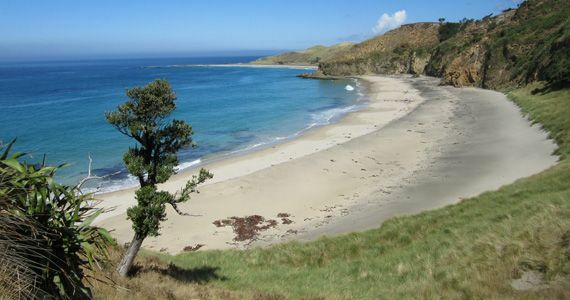 Pitt Island has some of the oldest and youngest geology visible in New Zealand. New discoveries are still being made. On Pitt Island you can observe the oldest-known formation of sedimentary rocks in the Chathams. They are between 90 and 100 million years old. They are of special interest because they are organic-rich and suitable as potential 'source rocks' for the generation of oil and gas. To do so however, they need to be buried by about 5,000 metres of sediment. Nowhere else can such rocks be observed on land yet this formation is widespread deep below the sea floor in many places on the Chatham Rise. Several Geology tours already take place each year, please enquire to book your place. A birdwatchers paradise. There are no less than 52 native bird species on the Chatham Islands of which 18 breed no where else in the World. The vast majority of these species can be seen on and around Pitt Island. Species include: CI Tui, CI Tomtit, CI Fantail, Forbes Parakeet*, CI Red Crown Parakeet, CI Warbler, CI Pipit, CI Snipe*,CI Oystercatcher, CI Petrel, Royal Albatross, Antipodean Albatross, CI Mollymawk, Giant Petrel, Brown Skua, Broad-billed Prion, CI Blue Penguin, CI Shag, Pitt Island Shag. Banded Dotterel, NZ Shore Plover, Weka, Pukeko, White fronted Tern, White faced heron. And while we are not permitted to land on Mangere or Rangatira Islands, there is the possibility of seeing the NZ Shore Plover and possibly the famous CI Black Robin* from the water. Boat Tours to Rangatira, Mangere and Pyramid Islands with very good chances of seeing the CI Mollymawk and Shore Plover. Sea conditions permitting. Need we say it - Pitt Island is a photographers dream destination. 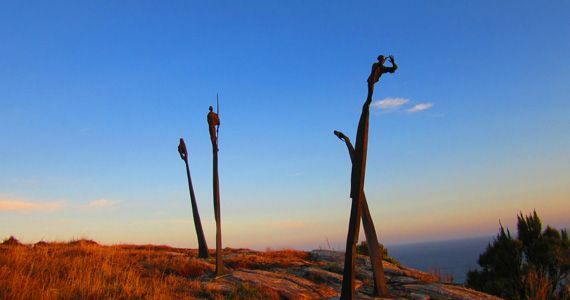 Whether you are into unique wildlife, strange plants, natural history or rugged scenery, not to mention the sometimes wild weather, this is the place for you. The clear skies and water provide a constantly changing landscape and colour palette. We are happy to get you to the sites that suit. Flowerpot Bay Lodge offers an ideal alternative corporate retreat - with peace and quiet and privacy guaranteed. Whether on a Team building exercise, board get-together or client treat, we can cater for your needs. We have the normal range of AV equipment, internet service and facilities available for mini conference needs. Couple this with some mild paced or adrenalin raising outdoor activity from our list of activities, and you have the perfect location for your next corporate retreat. Request a full quote, that way there are no surprises when you check out. Daily meal plan, full bkfst, lunch & 3 c dinner. Not included: Bar service, supplementary activities and main Island costs. Price guidelines for various packages. Price for Cessna transfers included above are based on five passengers sharing the flight. Price will vary depending on number of passengers on the day. For more information including casual rates, download the "Flowerpot Bay Lodge Information" sheet below. Receive a 10% discount on groups of 10. Free accommodation and activities for one person when you book a group of 10 for 2 nights or more. For a quote, please refer to our bookings page or email us directly. For those that have a particular interest in our amazing wild sheep hunting and fishing, there are a range of packages on the attached flyer to download. We can also tailor any combination package to suit your needs.â€‹ Download Hunting & Fishing packages information. 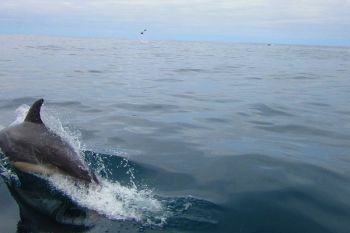 Shark Cage Diving - With Hotel Chatham Fishing Charters. Various operators offer boat and bus tours from Owenga, Waitangi, Port Hutt and Kaingaroa. All guest activities provided by Flowerpot Bay Lodge are fully guided by your hosts. Any choice of activities listed are available as part of any quoted package or at casual rates where listed. Because of our extreme isolation and limited access to emergency services, our Charter requires that guests are accompanied when visiting DOC estates or other private land. Guiding is included in listed rates and packages. Activities will be dictated by group consensus depending on weather conditions and fitness. A reasonable level of fitness is required to undertake most activities. 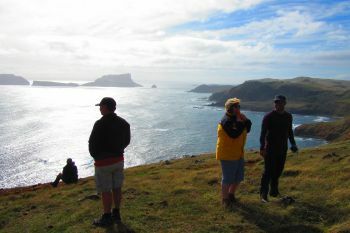 Pitt Islanders generally travel by quad bike. This is an ideal way to explore the island. 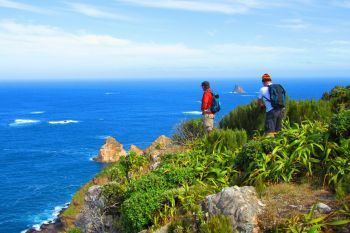 However, walking is an alternative low impact way to fully enjoy the scenery and tranquility the island offers. © Copyright 2019. Flowerpot Bay Lodge.